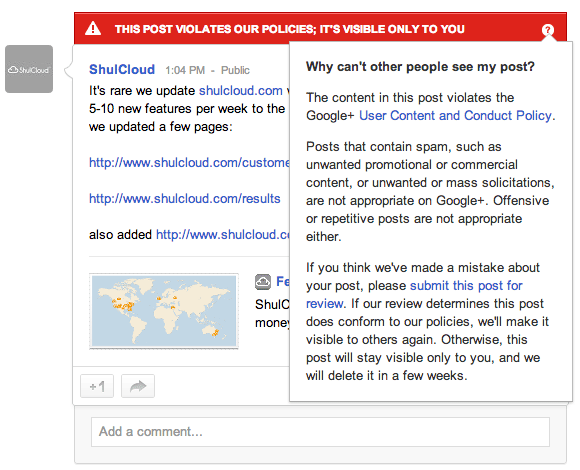 Google+ Spam Blocking: "This Post Violates Our Policies"
The other day, I posted a marketing message on one of my Google+ company accounts for a product I own named ShulCloud (basically a synagogue management software product). The message was about some updates we made to the front end of the web site. I was a bit surprised Google would block it being that this is a commercial page and heck, Google is constantly promoting their own stuff on their commercial Google+ pages. It is not like I posted it with notifications by email. Just a basic public post. 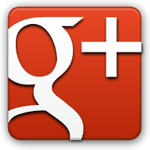 So hovered over the question mark and read all about Google+'s content policies. I then decided to submit this for careful review and now I am still waiting, about 15 hours later. The message now read "this post is under review; it's visible only to you."